(Virginia) — A Henry County sheriff’s deputy went above and beyond the call of duty to help a little girl after someone stole the girl’s bicycle on June 14. When the deputy found out the family couldn’t afford to replace it, he decided to replace it for them. 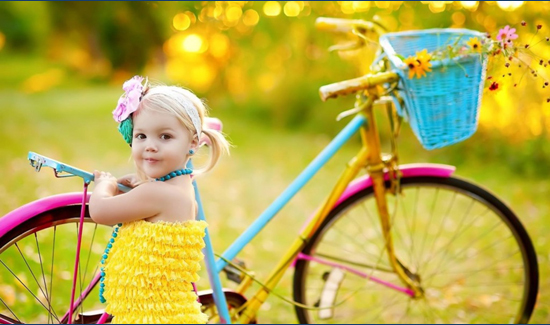 Alexis Jenkins, 4, loves cruising around on her new bicycle with her baby. “It’s not a real baby. I don’t have to name it,” Jenkins said. Her old bicycle, the one she got this past Christmas, was stolen last Wednesday along with her family’s lawnmower. Alexis and her mother had just gotten home from Florida on Wednesday and didn’t realize the bike and mower were gone until Thursday morning. “I was kind of dumbfounded, because I had been gone for several days, and none of my stuff had been touched. I get home, and then someone comes and steals some of my stuff,” Angela Nemeth, Alexis’ mother, said. A Henry County sheriff’s deputy came and took a report about the theft and then left. Alexis and her mother then also left and went to the grocery store. Not long after they got back, the deputy showed up again. Alexis didn’t have much to say about her reaction, but her mother said she got very excited.